No longer something out of your grandmother’s living room, the newest air movers can define a room’s style with unusual textures and modern finishes, while minimizing energy consumption. Will leaving my ceiling fan on all the time, even if no one is in the room, help reduce my overall air conditioning expense? No, a ceiling fan will not save energy if no one is in the room. Ceiling fans do not actually lower the temperature of a room; rather they make us feel cooler by moving air over our skin, which increases evaporation of the moisture on our skin. Ceiling fans save energy by allowing the thermostat to be kept at a higher setting, while making you feels as though it is six to eight degrees cooler in that space. The fan costs pennies per day to operate versus dollars per day for the AC. To maximize your savings, be sure to turn off the fan when a room is unoccupied. Just because it’s hot outside, you don’t have to sacrifice outdoor fun. 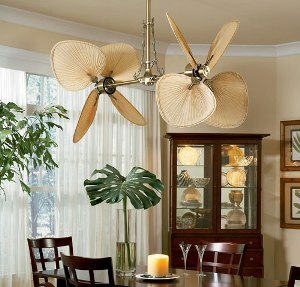 Ceiling fans can help keep your outdoor patio or gazebo comfortable, much like an actual room. Be sure to check your outdoor ceiling fan’s UL listing to make sure it’s compatible with the location. RegencyCeilingFans-2 The three possible fan ratings are for indoor, damp and wet locations. Fans that are rated only for indoors should not be used outside, even if the area is mostly covered. Moisture and humidity can affect the motor performance and stability of the blades. Wet-rated fans can be installed outdoors in situations where they will be in direct contact with water, such as in gazebos, above a patio or under a deck. A Hortons Home Lighting professional can create an inviting and welcoming look for your home. Visit a showroom near you today.